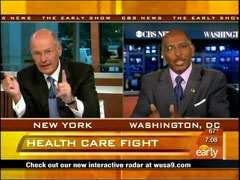 While arguing with Republican National Committee Chairman Michael Steele about health care reform on Wednesday’s CBS Early Show, co-host Harry Smith proclaimed: "...if the public option is socialism, then what is Medicare?....That people overwhelmingly think works pretty well for them." Steele pointed out Medicare’s obvious flaw: "Medicare’s a government-run program that is not – that is not doing that well....Harry, come on. How often do we have to do another reset on Medicare because it’s in default or running out of money?" Steele went on to challenge President Obama’s drastic approach to reform: "My only point is why do we have to up end 1/6 of our nation’s economy to fix what the President has now redefined-" Smith interrupted: "Because that 1/6 of our economy, left to go as it is, will bankrupt us." Apparently spending $1 trillion on a massive new government program will not. Earlier in the interview, Steele reacted to Obama’s upcoming address to Congress: "And after 26 speeches and 12 resets on this health care plan, tonight, in my view, it’s just one more opportunity to tell us what we already know." Smith responded by claiming: "Okay. Except polls would say the opposite of that." Steele replied: "No, the polls don’t...Harry I don’t know what polls you’re looking at. The polls don’t say the opposite of that." Smith defended his characterization: "The polls say they don’t really know what is in this health care plan or what the public option is." Steele pointed out: "Exactly, and what they – and what they do know they don’t like, which is why this thing has been tanking for the last three weeks. That’s my point." Immediately following Smith’s interview with Steele, co-host Russ Mitchell reported news headlines, including: "And thus far this morning, 9 looks like a lucky number. Some doomsayers had predicted the end of the world as the numbers turned to the ninth day of the ninth month of the ninth year of the new century. But others are getting married on what they think is a lucky day." Co-host Maggie Rodriguez chimed in: "President Obama’s sure hoping it’s a lucky number for him. Right?" Mitchell agreed: "Oh yes, yes he is." HARRY SMITH: Joining us now from Washington is Republican National Committee Chairman Michael Steele. Mr. Steele, good morning. MICHAEL STEELE: Hey, good morning, Harry. SMITH: A lot of conservatives around the country feel like the public option, which is still very much on the table and the President is going to talk about tonight, is socialism. Do you think the public option is socialism? STEELE: Yes, I do. And quite frankly, I think a lot more people are believing that there’s more to this than meets the eye. And – and the reality of it is, you know, I just don’t understand this idea that somehow people think that the federal government can enter into a marketplace and compete with private industry. That goes counter to everything that we know about how markets work and the role that the government plays in those markets. So the idea that you’re going to take an institution like, you know, the Department of Health and Human Services and then put that – put them in competition with private insurers, to me doesn’t make sense. If you have an insurance problem with one insurance company dominating a particular market, then break that up. There are incentives and disincentives that can be created that would create greater competition. But the idea that the federal government can come in and all of a sudden be the same as All-State in providing insurance is a ridiculous notion and that’s the problem here. The people of this country have figured this out and they’re like, you know, this plan makes no sense. And after 26 speeches and 12 resets on this health care plan, tonight, in my view, it’s just one more opportunity to tell us what we already know. STEELE: Harry, I don’t know what polls – Harry I don’t know what polls you’re looking at. The polls don’t say the opposite of that. SMITH: The polls say they don’t really know what is in this health care plan or what the public option is. STEELE: Exactly, and what they – and what they do know they don’t like, which is why this thing has been tanking for the last three weeks. That’s my point. SMITH: Alright. Let me ask you this – let me ask you this, if the public option is socialism, then what is Medicare? STEELE: Medicare’s a government-run program that is not – that is not doing that well. SMITH: That people overwhelmingly think works pretty well for them. SMITH: But people say ‘I don't want this public option, but don’t mess with my Medicare,’ you know that. SMITH: Because that 1/6 of our economy left to go as it is will bankrupt us. STEELE: That has – that has – that has redefined 1/6 of our economy to fix what he has redefined as a insurance problem. If this is a matter of getting a certain number of people insurance, then let’s work to get them into the insurance market. There are ways to do that. You can create a situation, with respect to pre-existing conditions, address that issue through portability. You don’t have to up end the entire system. To do this comprehensively just is not the way this should be done in my view and in the view of a lot of people. SMITH: Alright. Mr. Steele, as always, a pleasure to chat with you this morning, thanks. SMITH: You bet. Russ Mitchell is at the news desk this morning. Should be an interesting speech tonight. RUSS MITCHELL: It certainly should. Interesting interview right there, Harry.